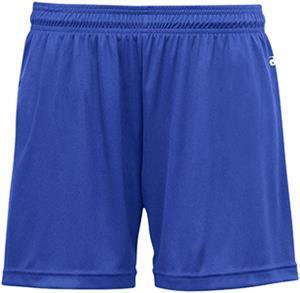 Badger Sport B-Core Girls Performance Short. 100% polyester moisture management/antimicrobial performance fabric. 4" inseam. Double needle hem. 1.5" covered elastic and drawcord. Badger heat seal logo on left hip. Waist (relaxed)/on the half 11" 11" 12" 13"